The Election Commission, which had examined the video of the voting, said the rule was very clear that the elector has to show his ballot paper only to the authorised representative of his party "and to no one else". New Delhi: The counting for elections for three Gujarat Rajya Sabha seats was to start late on Tuesday night in Gandhinagar after the Election Commission accepted the Congress claim that votes cast by its two rebel lawmakers should be cancelled because they had shown their ballot paper to the BJP chief Amit Shah. "The Commission has viewed the video recording of the votes cast by the said two MLAs and it has been observed therefrom that the said two electors violated the voting procedure and secrecy of the ballot papers cast by them when they exercised their right to vote," the order signed by Chief Election Commissioner AK Joti and Election Commissioner OP Rawat said. 176 legislators of the Gujarat assembly voted today. With the two votes being declared invalid and the total valid votes down to at least 174, each candidate needs 44 votes to win. 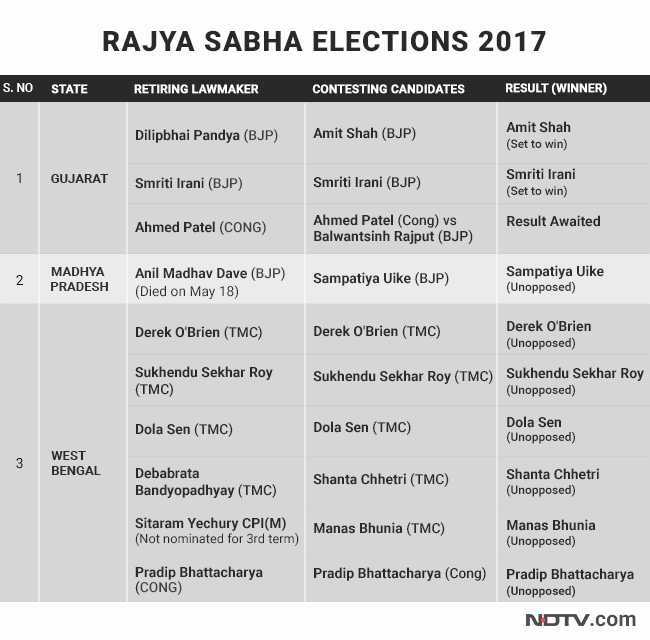 "I appreciate this order," Mr Patel told NDTV, pointing that the Election Commission order would reduce the quota of votes "a little bit" to 44 votes. Mr Patel said he was "confident" of his victory but did not elaborate how the numbers would add up, pointing that he would rather wait for the outcome of the election. Earlier in the day, Ahmed Patel had said he is sure of 43 and was hoping for the support of one legislator of the Janata Dal United and one of Sharad Pawar's NCP. The Congress had cited precedence to say that the two MLAs must be disqualified before counting can begin. 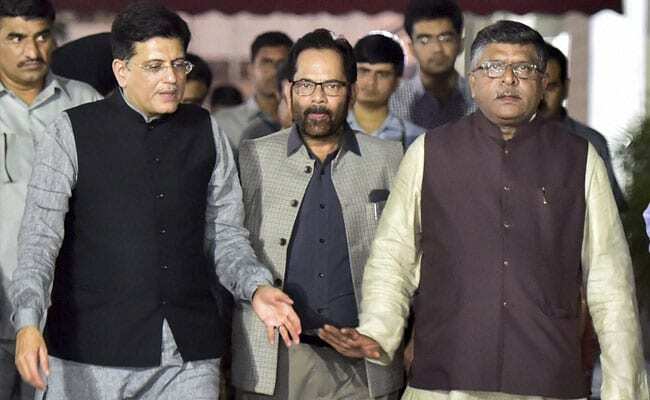 The party has requested the Election Commission to review video tapes from the election and already three Congress teams with top leaders like P Chidambaram and Anand Sharma have visited the poll panel's office. 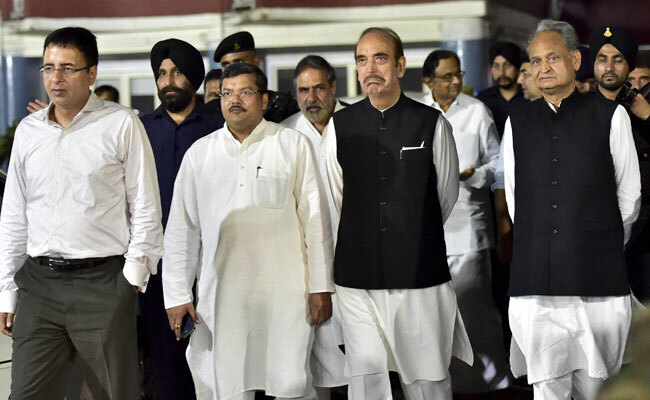 The BJP too has sent a team twice led by Union Finance Minister Arun Jaitley to the Election Commission to counter the Congress and demand that counting of votes begins. "If the BJP is so confident of winning the election then it must abide by the law. And the law is very clear. If the ballot is seen by a person other than the authorised person then it is liable to be rejected. BJP was beneficiary of this law on June 11, 2016. How was law changed in one year? These two ballot papers must be rejected," Mr Chidambaram said after meeting the Election Commission. The BJP has said the Congress has made "baseless allegations" accusing the rival party of raising a "non-issue" as it "senses defeat" for Ahmed Patel, political secretary to Congress president Sonia Gandhi. "The Congress's allegations have no substance and they are setting a wrong precedent," said BJP's Ravi Shankar Prasad. Amit Shah will make his debut in Parliament with today's election and union minister Smriti Irani will be re-elected to the Upper House - the BJP has enough legislators in the Gujarat assembly to ensure that and then some. For the third seat they have fielded former Congressman Balwantsinh Rajput to challenge Ahmed Patel. That was turned into a close contest due to the defection recently of six Congress MLAs and also cross-voting today, all by MLAs close to local politician Shankarsinh Vaghela who is seen to be exacting revenge for the Congress' refusal to project him as presumptive chief minister in assembly elections in Gujarat later this year. The BJP has asked why the Congress did not object immediately today as its two rebels voted. Mr Chidambaram said they were waiting for the poll officials to act.